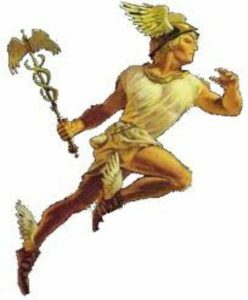 Mercury is often described as the fleet footed messenger and depicted with wings on his feet, showing that he is elevated above the other planets because of his capacity to use reason. 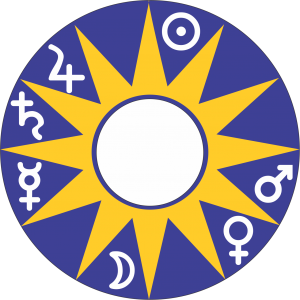 In the system of the Joys of the Planets (shown in the logo for this web site) Mercury rules the 1st house, which is the threshold between the celestial and the mundane worlds, the inner and the outer. This unique placement reflects the human condition. Mercury rules intelligence, knowledge, subtlety, cleverness, eloquence, and things which resemble or augment the mental process such as keys and computers (advanced calculating machines). And following this association are puppets and repositories of knowledge such as books, papers, letters, medicines, web sites and social media. 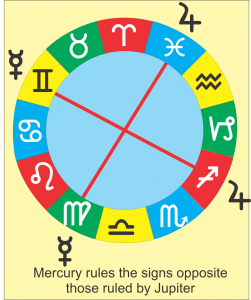 Mercury is particularly associated with communication and rules articulation, speech, and everything associated with message sending such as emails, text messages on mobile phones and associated media. Mercury is also associated with delivery systems such as post and mail, couriers, and transport of all types; and therefore is associated with vehicles such as cars, trucks and aircraft. Public transport however is associated the Moon because it moves the common people in big numbers, and because the Moon is the fastest moving celestial body from the earth’s perspective, connecting one planet with another, it is also associated with transport, messages and linking people together. things and rules the signs opposite those ruled by Jupiter which is the planet of big things. This association with small things as well as variety explains its connection with things which have variety or are mixed, such as pizza, sweet and sour sauce, mixed lollies; and also those hings which are small and numerous, such as berries, ants, insects and currants. It the natural world Mercury is associated with wind, which transports heat and oxygen; and also things which produce wind, such as beans; as well as earthquakes, which are the wind beneath the earth. Mercury awarded a unique place in astrology. As already mentioned in the system of Planetary Joys it is placed in the house through which planets ascend towards the Midheaven. Also it is the only planet in this system without a complement in the opposite house, and the only planet in an angular house. 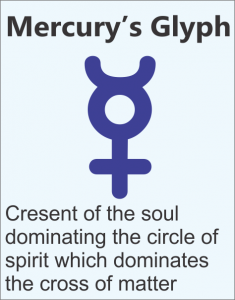 Also the glyph for Mercury is the only one among the classical planets to incorporate all primary components: the circle of spirit, the crescent of the soul, and the cross of matter. Dignities: Rules Gemini and Virgo, is in detriment in the opposite signs of Saturn and Pisces, is exalted in Virgo, and in its fall in Pisces. Nature: Cold and dry, diurnal when rising before the Sun (oriental) and nocturnal when rising after the Sun (occidental), feminine when with feminine planets and masculine when with male planets. When negative: Perjury, trickery, deviousness, lying, cheating, prattling, idle chatterer, critical tongue. Physical appearance: Middle height to tall, slim, high forehead, thin lips, straight hair. Occupations: Servants, students, thieves, con men, auctioneers, agents, dealers, bankers, business people, traders (including the share market and ebay), merchants, humorists, astrologers, clerks, accountants, couriers, writers, advocates and spokespeople including media representatives, one’s ‘second’, literary people, mathematicians, philosophers, secretaries. Animals: Monkeys, apes, fox (because of its cunning), laughing hyenas, hermaphrodites. Birds: Parrots, cockatoos (because they imitate speech). Minerals and Jewellery: Quicksilver, stones with diverse or variegated colours. Places: Markets, fairs, trading floors, computer rooms and stores, tradesmen’s shops, schools, tennis courts. Anatomical: Tongue, brain, arms, hands, fingers.